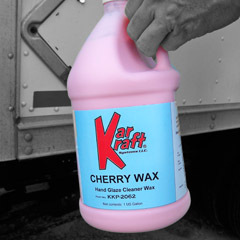 Cherry Wax is a cleaner wax that combines light cleaning with great workability and superior protection. A favorite of New England professionals for years, it is now available to all Kar Kraft customers. Cherry Wax is a blend of quality waxes that provides an easy-on, easy-off application and fabulous shine. Apply and remove by hand or orbital buffer.